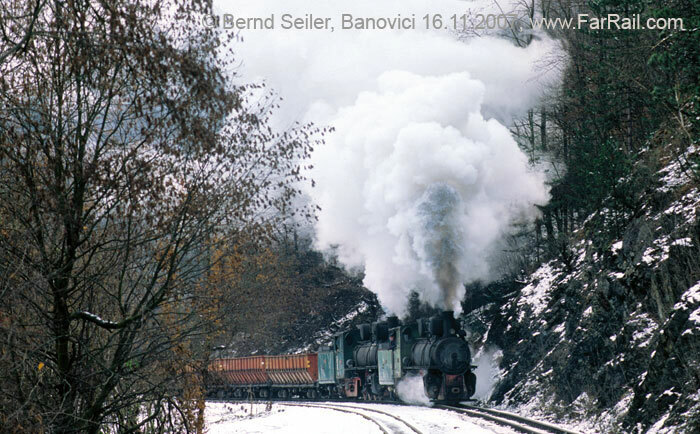 At the end of February 2012 we’ll have the very rare chance to see a double headed freight train hauled by two class 83 0-8-2 locomotives over the scenic narrow gauge line of Banovici. One of only two class 83 locomotives, which didn’t end up on the dump track at Banovici still has a valid boiler certificate until early March while the other of those two gems will return from a heavy overhaul to the roster at the beginning of February 2012. That means there will be a few days of overlap in having two serviceable class 83 locomotives  and we’ll use these few days for running two charter trains with both locomotives. To avoid exploding costs we didn’t plan any activity on the standard gauge. 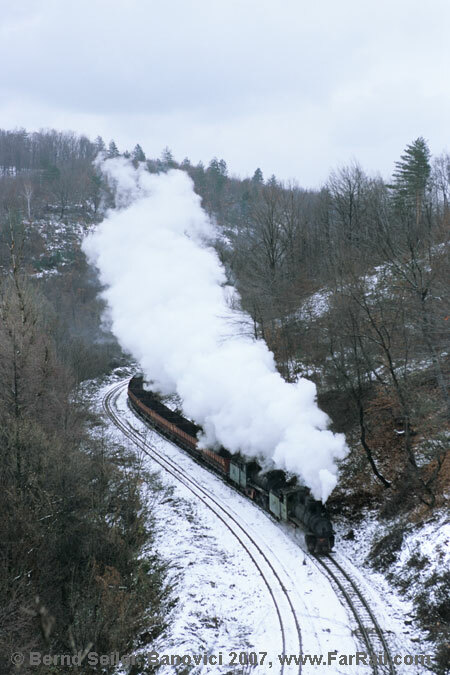 All possible steam events on standard gauge in Bosnia-Herzegovina we already celebrated in the autumn of 2011. 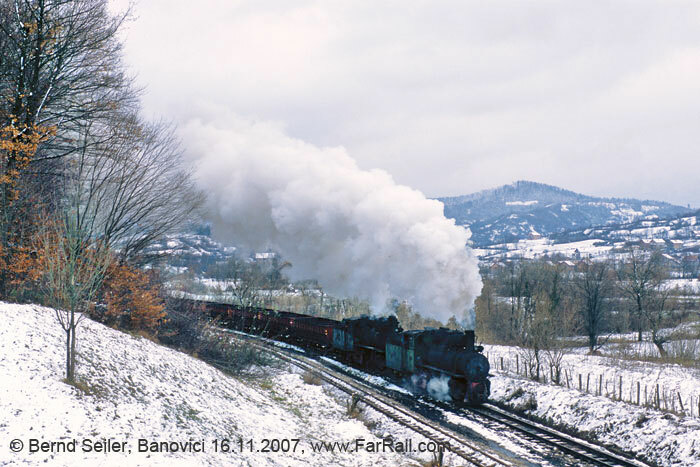 Individual journey to Banovici (flights can be booked via FarRail Tours). We recommend to travel the evening before to Banovici and take part on our visit to the workshop of Banovici at 09.30 hrs. Afterwards meeting in the narrow gauge station Oskova. 13.00 hrs departure with a double headed class 83 freight train, consisting of some nine coal wagons. 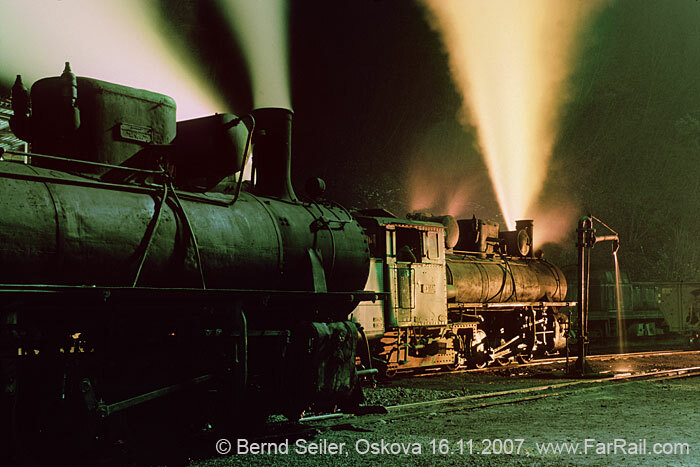 After our return to Oskova we’ll arrange a night shoot with 2 x 83 and one loco class 25 (Skoda 0-6-0 tank) in Banovici. Accommodation in the forest hotel Banovici. Departure Oskova ca. 08.45 hrs with one class 83 hauling a some nine wagon long coal train and another class 83 loco banking it. About 12.30 hrs return to Banovici (Oskova), where our programme will come to an end. The coal mine line of Banovici uses, besides their diesels, occasional steam for shunting wagons in Oskova. The railway has the “Bosnian narrow gauge” of 760 mm. For shunting the wagons in Oskova they recently put one of their class 720 diesels back into service which limits steam shunting in Oskova to a minimum. If there is a need for steam they either use the class 83 (0-8-2 from Slavonski Brod) or the last serviceable class 25, a Skoda-built tank engine. The diesel locomotives class 720 (B-dh) and 740 (B’B’-dh) are used to operate the main line and the shunting duties. The station at Oskova is covered in shadow from the nearby mountains until the late morning. But the line is winding in curves out of the valley, and even in the forested part of the line the sunrays reach the rails in the afternoon. Stare Omazice is the abandoned junction where we expect the first sunlight on our train (if no clouds prevent the sun from shining). On the double tracked main line, the city of Banovici is reached, where the workshop and a mine are situated. Up to Grivice the line remains double tracked. Shortly before Grivice we’ll find some more nice photo locations with a long straight part, a mosque in the backdrop and another nice S-curve. From Grivice up to the open cast mine at Turija the line continues single tracked. More good photo positions can be found here. One of the better locations, a “photo hill” will be possible probably for the last time. They’ve planted new trees there and next spring these threes will grow into the view of the line. The whole line from Oskova to Turija has a gradient against empty, chimney first hauled trains. On the second day we’ll focus on backlit shots, when the exhaust of our banking engine can be clearly seen in the shot. We’ll go as far as a short way above Grivice and then roll down back to Oskova to make sure everyone can reach his return flight in time. We’re probably travelling on a flat wagon on our train. Please wear appropriate clothes which could become dirty and should protect you from the probably cold air. Travelling to and from Banovici should be arranged individually, although we can book your flights as well and, if some people wish, a self driven minibus on a cost sharing basis. You should consider flying via Belgrade. There are more connections to Belgrade than to Sarajevo and the driving time from either of those two cities is very similar. Driving in Serbia and Bosnia is quite easy with nearly the same restrictions in place as in any other central European country or in the UK. 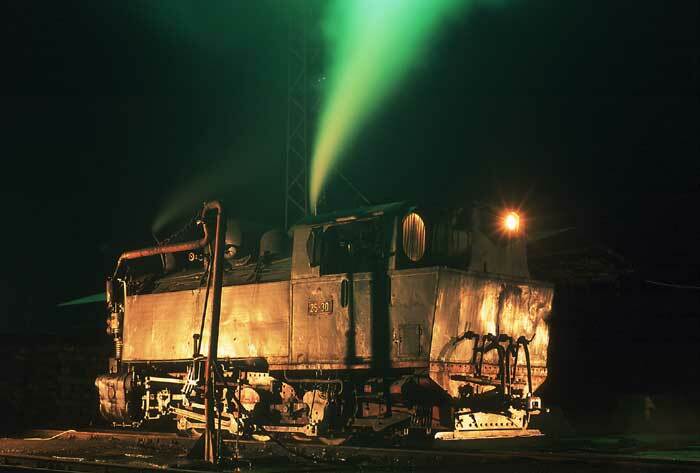 If you want, you can, of course, explore the remaining steam in Bosnia before or after the tour. The permits for the Kreka mines, Sikulje and Dubrave, as well as for the (Sunday closed) workshop in Bukinje could be organised by us. However, the service fee of our man in Belgrade must be added. As you need to apply for these permits a week in advance and driving from Belgrade to Tuzla and back is involved, some effort is involved. The permit itself costs 50 Euros per day and person. Bosnia-Herzegovina and Serbia are secure and hassle free places for travellers. Of course, the mentality of the locals is different from central and northern Europe especially when some alcohol is in the game. But this will not affect our tour at all, at work (most of) the railway men will strictly stick to their coffee. For ethnic reasons, Bosnia-Herzegovina is separated into two parts. You’ll not be aware of the border between the two states, the Republika Srpska and the Bosnian-Croatian Federation. The standard of our hotels cannot be compared with central European standards. They have a few refurbished rooms  which go to the six people who register first. The rest of the rooms is still in a “Toto-condition”. Prices are the same, so just be the first who register and you’ll have the advantage of a nicely refurbished room. Please accept that not everything will be perfect. However, the supply of food is certain, quality and quantity are quite good. Vegetarian food is not common and might be difficult to get. Although for visitors of many countries it’s possible to enter Bosnia-Herzegovina and Serbia with a valid ID card we strongly recommend you take your passport with you. We are travelling in the Winter. The weather can be anything from snow showers at minus fifteen degrees to deep blue sky and plus 10 degrees Centigrade. Please carry appropriate clothes with you to be prepared. The tour is planned with the dedicated photographer and videographer in mind. We will use the daylight hours for photography rather than for substantial meals. It never hurts to carry a few snack foods along, just in case meals are delayed a little. For night photography you’ll need a tripod. In Banovici there are only two serviceable class 83 locomotives. So it may happen that we won't see the described locomotive. In this case we will try to find an adequate alternative. However, we are at the edge of a steam free age, and no one can guarantee that we’ll see what we have planned and paid for. Be assured we will do everything possible to make things work. We cannot offer refunds if things go wrong. For our tour there is no insurance available against a steam loco failure. Please bear in mind that accommodation and transportation in Bosnia and Herzegovina as well as Serbia may fall short of EU and North American safety standards. Always use common sense when crossing roads and railway tracks. FarRail Tours cannot be held responsible and will not accept any liability whatsoever in the case of any accident, damage or delay. We suggest you take out a comprehensive overseas accident and health insurance policy.